The 30-year-old was hired by Laimbeer as the team’s general manger in December, and has since assumed a bulk of the scouting, and engaged in trade negotiations with other executives in the months leading up to Wednesday’s WNBA Draft, in which the Las Vegas has the No. 1 overall pick. 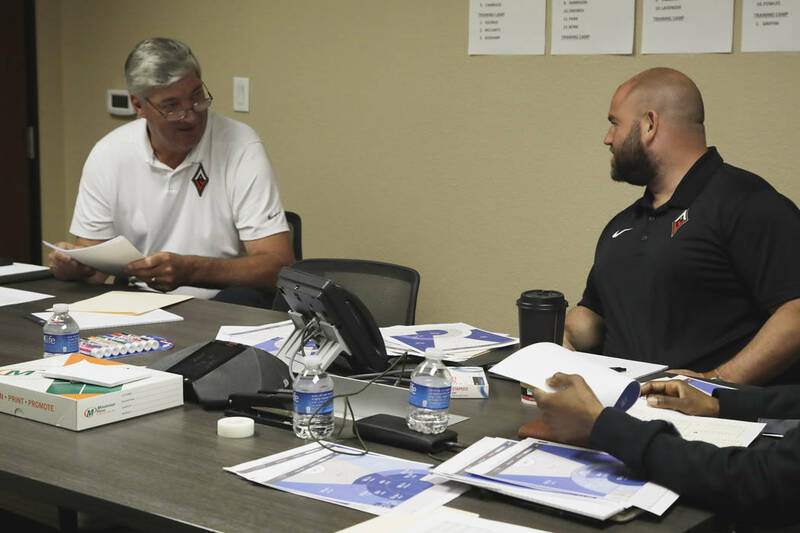 Aces general manager Dan Padover (middle) meets with head coach Bill Laimbeer and assistant coach Vickie Johnson on Monday, April 8, 2019. Courtesy Las Vegas Aces. Dan Padover graduated from the University of Connecticut with a degree in business administration and a lucrative future in financial services. Instead, Padover found a different calling. He took a volunteer position with the Huskies women’s basketball team in 2010 and launched a career in basketball, making stops in Philadelphia, New Jersey, New York — and now Las Vegas with the Aces. Padover, 30, was hired by Aces coach Bill Laimbeer as the team’s general manager in December and has since assumed a bulk of the scouting while engaging trade negotiations with other executives in the months leading up to Wednesday’s WNBA draft, in which Las Vegas has the No. 1 pick. Laimbeer still has final say on all decisions but has relied on Padover’s expertise the last four months as he prepares for the WNBA season. Padover as a lifelong basketball fan certainly hoped to work in the sport, but prepared academically for a position with an insurance company, Liberty Mutual, for which he interned in college. He scored a volunteer position as a video coordinator with UConn’s women’s basketball team, though, and applied on a whim after graduation for similar positions with several NBA, WNBA and college basketball teams. The Philadelphia 76ers responded, offering a job as an assistant video coordinator. Albeit, an unpaid one. He eagerly accepted, triggering a chain of events that altered the trajectory of his future. Padover spent the 2010-11 NBA season with Philadelphia reviewing game film and preparing scouting reports for the coaching staff. The team couldn’t retain him ahead of the 2011 lockout, and an assistant coach referred him to a video coordinator position the women’s basketball team at Rutgers, where he worked under legendary coach C. Vivian Stringer. The same position opened in 2012 with the New York Liberty, and he worked both jobs until the organization hired Laimbeer, who tabbed Padover for full-time work in 2013. He spent six seasons in New York’s front office, and served most recently as its general manager after Laimbeer departed in 2017 for Las Vegas. Laimbeer ran the Aces’ front office during their inaugural season, but sought some relief from the day-to-day administrative responsibilities as the team approaches its second season. He contacted Padover before the holidays.